Activities | Welcome… | We're glad you stopped by! Join us to celebrate 50 Years! Click the Birthday Party invitation for details. Dinner will be provided by the club! The date for the VCMHC annual meeting, banquet and awards presentation is Saturday, Nov. 19, 2016, at the Parizade Restaurant in Durham. The board and show committee meetings will begin at 4 pm, followed by a general meeting/election of officers at 4:30. Social hour with cash bar is 5-6 pm with dinner served at 6. The menu includes a salad; choice of salmon, shrimp, chicken breast or pork tenderloin with vegetables; tea and dessert. The price is $40 per person. There will also be a silent auction so bring anything, “horsey” or not, to add to the collection. Elizabeth Abernathy always does a great job finding prizes for the champions and reserve champions and I am sure this year will be great! For those who were fortunate enough to take home perpetual or challenge trophies last year, get them engraved and plan to bring them back ready to present. We also need sponsorships for each division so please volunteer, don’t make us have to beg! 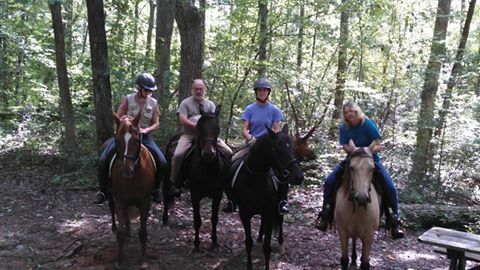 The Morgan Posse, Intelligent Design, Crestfield Double Joy, Glick’s Regent and Goldstar Bronze Spirit, missed all the other club Morgans on the trail ride today. They hope more friends will join them next year! They did enjoy the company of 3 non-Morgan friends, Pepper, Barley and Baby! Members and friends met Saturday morning at Cedarock Park, 4242 R. Dean Coleman Rd, Burlington, NC. The 414 acre city park includes equestrian trails, Frisbee golf and a historical farm. After enjoying the trails, which included, creek crossings and bridges, the riders reconvened for a picnic lunch. Please note, Joy is available for adoption thru Forever Morgans! She is a great trail horse!